Thank you all for marching in solidarity with women all over our country. We march today to take a stand against violence and oppression of every single woman. When we fight against our own oppression it can be easy to assume that everyone is having the same experience. However, it’s important to remember that as women, we experience forms of structural oppression and violence differently. For example, the rate of homicide against black, Native American, and transgender women is more than double that of other women. While we can all agree that marching is an important form of community engagement, we need to remember that what we do the other 364 days of the year is even more important. I invite us all to pause and reflect on how we show up and take a stand against violence in our daily lives. How does our speech or silence, our actions or inactions, support or harm people of color, immigrants, transgender folks and the most marginalized among us? How are we showing up when no one is watching? Are we doing the work necessary to understand our participation in these systems of power, privilege and oppression that surround us and are within us? How do we show up for immigrant women right here in the Keys when family members are separated and detained? How do we stand up for the dignity of incarcerated women? For women who have very different struggles from our own? Is it through a tweet or Facebook post? Is it through a march once a year? Because if we are honest with ourselves, we know that this is not enough. I invite us all right now to remember that our OUR LIBERATION IS BOUND IN EACH OTHER’S. If we truly believe in our city’s motto of “One Human Family,” it’s time to live it, not just as a feel-good motto of convenience, but through our actions and our willingness to put ourselves in spaces that might be uncomfortable. In fact, let’s go ahead and get comfortable with being uncomfortable, because it is required for social change! We need to listen to criticism without getting defensive. While defensiveness is normal, it is simply our ego’s way of protecting and maintaining current systems of inequality and oppression. It’s time to make it a priority to go out of our way -- and maybe comfort zone -- to educate ourselves on struggles beyond our own. That is the only way we will grow individually and collectively. Dismantling racism and white supremacy will not happen overnight, and will not happen by saying we are color blind or by ignoring our own biases. 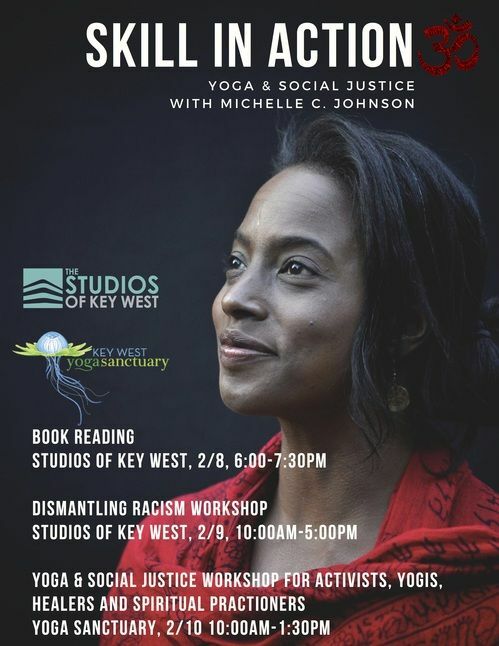 Marchers and friends, I invite you to join us in a Dismantling Racism workshop led by an expert in anti-oppression training, Michelle C. Johnson, on Saturday, February 9th from 10am to 5pm at The Studios of Key West. Michelle will lead us through a interactive workshop to understand systems of power, privilege and oppression. Sunday, February 10th, from 10am to 1:30pm Michelle is holding a “Skill in Action” workshop for, activists, yogis and social change makers, where we will explore the intersection of spirituality and social justice. To make the Saturday workshop accessible to all who want to be there, we are offering a sliding-scale pricing from $100 to $150, with scholarships available. Please consider donating to the scholarship fund today or join us for Bingo Night at The Green Parrot Jan 28th 7-9pm to raise $ for workshop scholarships. Women’s March Florida, Florida Keys, is a small but mighty group that meets regularly to focus on a variety of community-centered direct actions, such as hosting educational panels and workshops, supporting resolutions at City Hall, and being in solidarity with our immigrant community. I want to thank Lizzy, Martha, Analise and Darlene for always showing up and continuing to do the work -- even when no one’s watching. I truly hope to see you at the workshop next month as we continue on this journey towards justice. 5/27 WMFL Call To Action Against the State Sanctioned Mistreatment of Immigrant Children and Youth. MAY 19: HANDS ACROSS THE SAND5/27 WMFL Call To Action Against the State Sanctioned Mistreatment of Immigrant Children and Youth.